Save time and money with this self tapping swingarm bolt. Made in the USA of heat treated, flame hardened, 1045 steel, this bolt will repair damaged threads in your left hand swingarm mount. 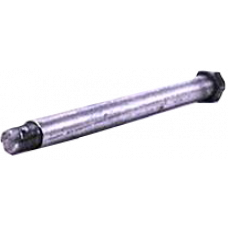 This 0.025 oversize bolt will restore the stripped out threads without the need of taps, or Heli-coils™. Works on all Big Twin 4 speed models 1958/1984 (except Softail).